We had agreed to meet up with our guide Parison in the afternoon to check out "The Market" (his words). We had pictured walking through town checking out tables spread with locally crafted jewelry and home grown fruit and vegetables, items we were anxious to stock up on. We were also hoping to meet more of the people who choose to scratch out a living in this very hot and seemingly inhospitable Lake Natron area. Parison was right where he said he'd be, sitting on a large tree root out in front of his family's campground. Seeing us approach he stood and gathered his walking stick, ready for the afternoon's adventures. We drove down the road towards town and he gestured for Mark to turn into a dirt lot, which was teeming with goats and their handlers. "Here?" Mark was a bit confused. "Yes, yes. The market." 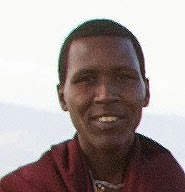 Parison got out of the car and started greeting each of the Maasai herders by name, shaking hands and joking with them. He led us through a gate and into an enclosure made up of woven tree branches, a rough fence to keep the goats and cattle in one place on the dusty hillside. We stood under a tree and watched as two older gentleman poked and prodded each of the goats as they were presented. Parison explained in hushed tones that these were the elders; they judged each of the animals that were for sale and sorted them by certain criteria. The fatter, healthier ones would bring a much bigger price. We watched as the serious business of sorting the animals and haggling took place in front of us. Parison explained that taking care of the herds was a man's work and women were not allowed at the market. I had noticed I was the only female there, and frankly, it was making me a bit uncomfortable. No one really acknowledged us; I think the locals were all used to tourists coming through; I'm sure I was having more trouble with it than they were. Somehow it felt disrespectful to be breaking the rules just because I was a visitor. It seemed the buyers and sellers were in no particular hurry and it was sweltering even in the shade of the tree, so we walked back to the car. Parison asked if we'd like to get something cool to drink. Sounded like a great idea to us. He guided us up the road into town, having us pull over into another dirt lot next to an open bar area. Under a thatched roof, plastic chairs and tables were set up around a pool table that was propped up on various pots and bits of scrap metal that helped level it on the dirt floor. Several guys were hanging out at the bar and watching as a few others played pool. Parison called out our order to the owner. "Do you play?" Parison asked Mark. "No, not really. I'm not much of a pool player." Parison looked disappointed; I think he really wanted to hang out with his friends and play a few rounds. We sat and watched silently for a while, slurping our cokes before they had a chance to warm up in the sun. "MAaarrrkk." Oh no. We had been found. Elizabeth walked in trailing a small assortment of her daughters, granddaughters and various female relatives. It was Parison's mom, the one we had met at the lake that morning, the one who had taken a shine to Mark while I was being accosted by the rest of the sales crew. "Mark. Pretty? You buy for mama!" Elizabeth held up a string of bracelets, smiling and nodding, willing him to buy something. "Yes pretty. But no, we cannot buy anything now." Mark's smile was looking a bit strained, his eyes darting back and forth for an exit. We were trapped. They all trouped into the bar and sat down at the table with us. It was a little annoying in a way, being subjected to pressure sales tactics while trying to enjoy our cold drinks. But once they realized we really weren't going to buy anything they just sat in the shade and talked with one another. It was nice to see Maasai women up close, they always seemed to be lurking in the background at the other places we had been. Mark thought this sounded like a pretty fair deal. I punched him in the arm. Parison laughed. We asked him how many wives he had. "Only one right now. And I have one child." Mark asked him how many wives he thought he might have. "I cannot guess. But probably at least three." He smiled at Mark: "And you?" Mark looked at me and shook his head. "Only one. That's all I can handle." It was Parison's turn to shake his head and laugh. What kind of place only allows for one wife? How ever would all those chores get done? We finished off our cokes and it was time to go. Elizabeth made one last half-hearted attempt to sell Mark some earrings, then we climbed into our car. 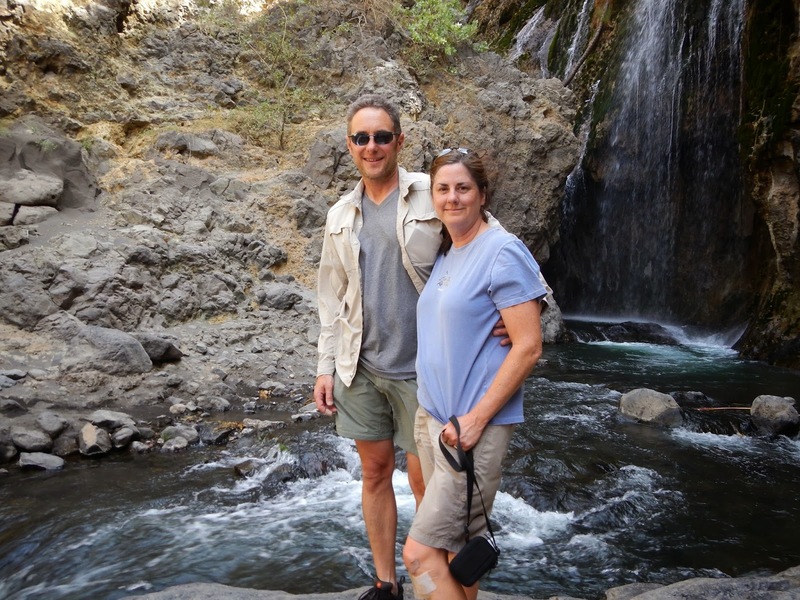 Our last stop was going to be a hike up the river to the waterfalls, something we were looking forward to in the heat of the afternoon. The base of the waterfall trail. 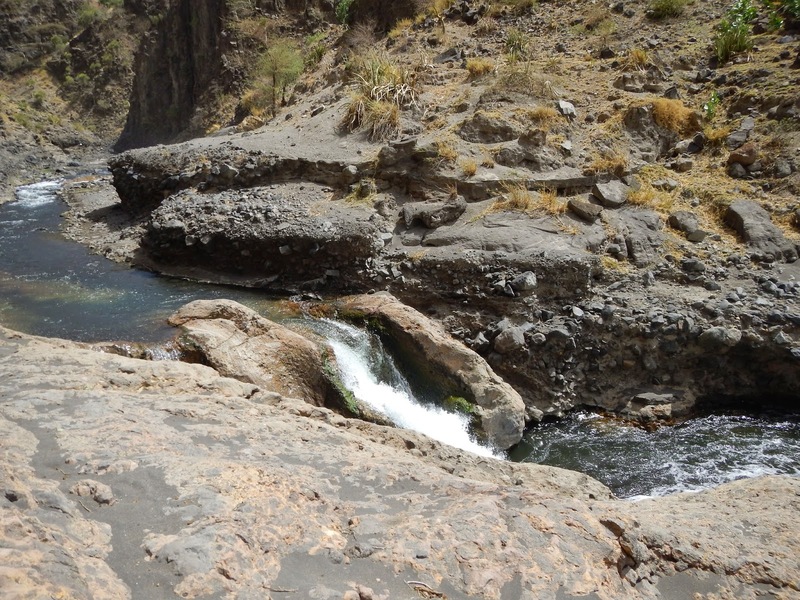 The Engaresero River is fed from springs that originate in the Ngorongoro Crater area. We drove out of town once again, crossing the river that seemed so out of place in the dry desert and turned up a road leading into a canyon. We parked under a scrubby tree and were greeted by some young boys that were hanging around the parking area. We seemed to be a curiosity to them, or perhaps an easy mark. It was always a toss up out here. Flexible black pipes served to carry water down to the village. as the water surged through it. Parison led us up a path beside the river. 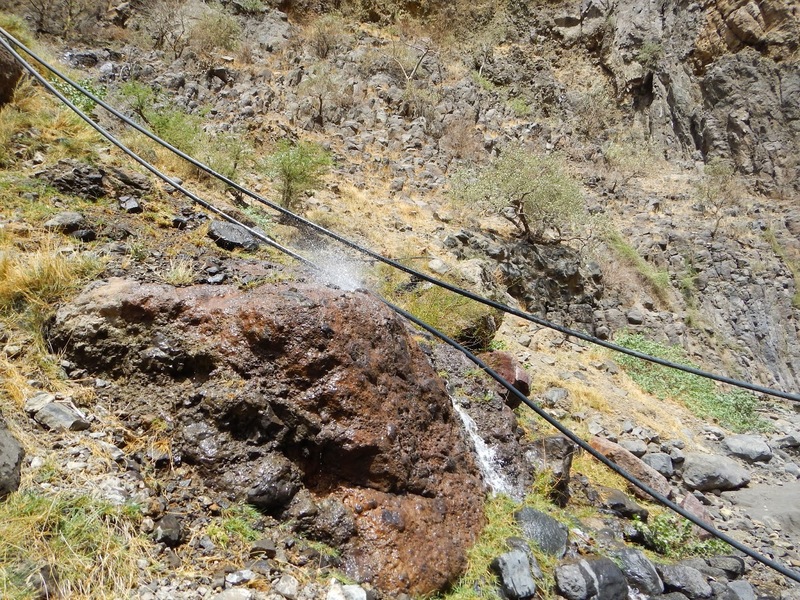 We had to climb over a few thick plastic pipes that were draped down the hill; he explained these were what supplied the village with water. One of the pipes had sprung a spectacular leak and was spraying water high into the air; it looked like someone had tried to repair it at one point with some duct tape, the tattered ends of which were flapping in the spray. We made our way up the river, crossing it several times as access to the path petered out on one side then the other in the narrow canyon. After twenty minutes or so we came to the end. 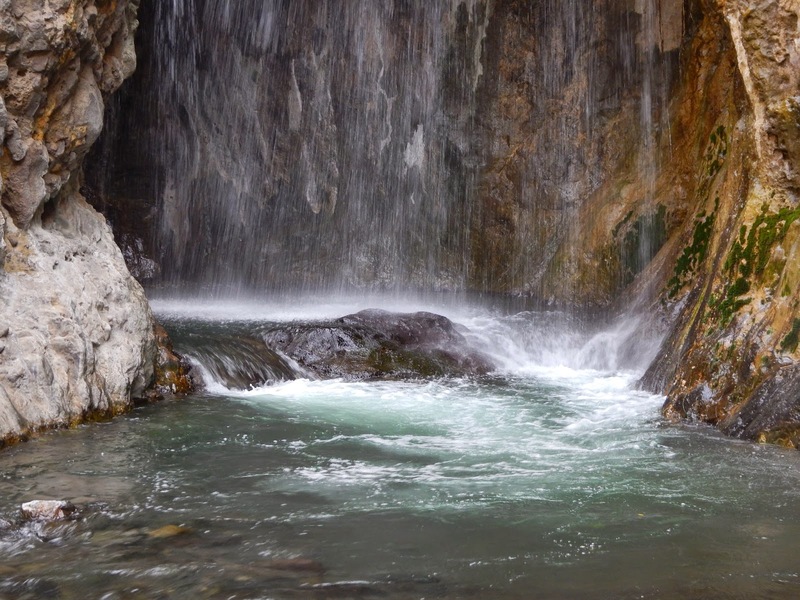 A spectacular waterfall blocked the way, the water coming over a sheer cliff. 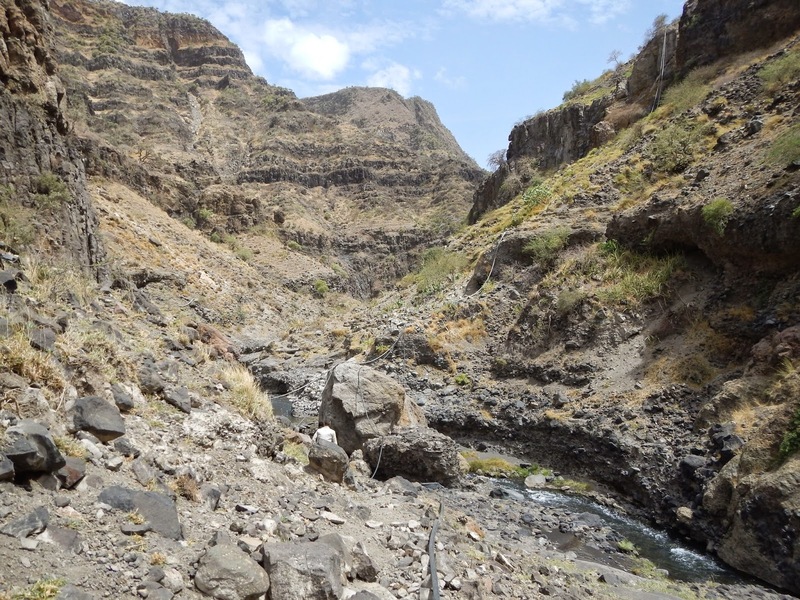 Parison told us the water came from a spring in the Ngorongoro area. He invited us to take a swim and with the bored look of someone who had seen this view too many times, he promptly took off his belt, put down his walking stick, laid back on a rock and closed his eyes. Parison was officially on break. We took photos and a video, marveling at the amount of water that was pouring into the ravine. Ferns and other greenery were sprouting from the cliff, waving in the wind created by the force of the water. It all seemed so out of place considering the Lake Natron valley only gets a few inches of rainfall in a year. The base of the waterfall, a welcome change from the dry desert. We hadn't really come prepared to swim, and I was a little worried about my knees in the water. Just a few days before we left for Tanzania I had fallen and scraped the skin off both my knees. I had done a good job too, nice deep scrapes that were still raw and oozing days after the fall. I had been struggling to keep them clean and protected all week, washing them as best I could and putting on new bandages every morning, but it was a losing battle in the dust and grime that is camping in Africa. Prominent in my brain were the warnings of waterborne beasties that could use any opening in the skin as a welcome mat. As much as I love company, I wasn't feeling the need to invite that kind of guest. Mark and I at the base of the falls. Notice the bandage on my knee. We finished up with our photos and headed back down the river the way we had come. About halfway back I stepped into a hole in the riverbed plunging up to my waist into the water. When I emerged my bandages were hanging by a thread, revealing waterlogged scabs and raw skin that looked much more gory than it felt. I tore what was left of the bandages off and kept going, figuring whatever was going to happen probably already did (and if it did what a great story!) At the base of the trail we ran into another group on their way up. An ancient Maasai man was leading a group that included two women, the very ones that were making a fuss about the bats flying around in the restaurant the night before (story here). The older woman kept staring at my knees, shaking her head slowly back and forth. 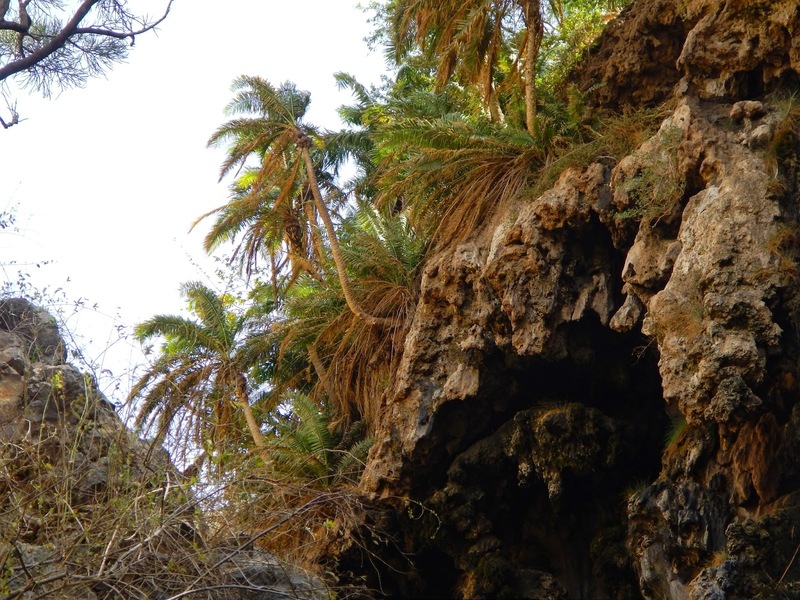 Palm trees clinging to the side of the cliff above the falls. We greeted the group and met their guide. Murunga was excited to hear we were from the U.S. "I have been! I visited Washington DC in 1968. I wish to go back someday." We shook his hand and told him we were from California ("Oh! Hollywood!") and admitted that we had never been to DC. Unlike most of the guides we had met in Lake Natron, Murunga spoke almost perfect English; he had spent some time in the U.S. going to school in his youth. He was fascinating to talk to and I regret not taking his photo; he had the most interesting face, worn from the years of squinting into the sun and wind. In the meantime, the older woman was still staring at my knees and speaking rapid fire French to her companion. She pulled on my arm as I walked past, almost in tears. At first I didn't know what she was talking about. Murunga laughed and told her no "it is just a walk in the water." She didn't listen to him, she was still holding my arm and repeated "Dangerous?" "No, no! I was hurt before I started. No the walk is fine." I tried to reassure her but she wasn't having any of it. There might have been translation issues (or perhaps she had already made up her mind) but she insisted on turning around. Poor Murunga had lost a client. A small waterfall in the lower Engaresero River canyon.